One of the most iconic landmarks in Dubai is the Jumeirah Mosque. Adopting an ‘Open Doors. 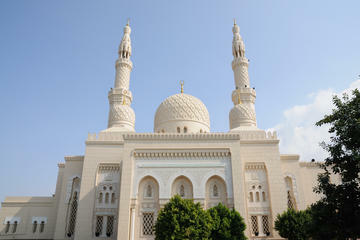 Open Minds’ policy, the mosque welcomes visitors of all faiths to admire the surroundings and learn about Islam and the local culture.The Jumeirah Mosque, which is large enough to hold up to 1,200 worshippers, was built entirely from white stone in the medieval Fatimid tradition, with towering twin minarets framing a large central dome. When it's lit up at dusk, the intricate artistry and true beauty are highlighted. 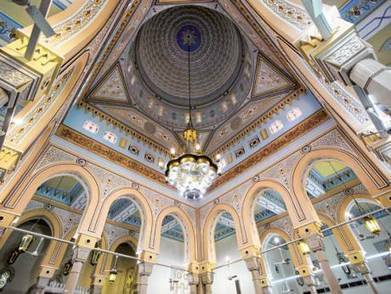 Local mosque representatives are on hand to conduct 75-minute guided tours six days a week at 10am. These tours are run by the Sheikh Mohammed Centre for Cultural Understanding and offer visitors an opportunity to learn more about the Emirati way of life and religion.Islamic holidays, rituals, traditions, cuisines and customs are all detailed in this tour. You can also hear more about the fasting month of Ramadan.Visitors are encouraged to ask questions and photography is welcome. You can even sample traditional Arabic snacks including coffee, dates and other varieties of food. Tours and learnings are conducted in a welcoming and friendly environment, with special age-appropriate programs available for children as well. All visitors are advised to act respectfully and dress modestly; traditional attire is available to borrow. Women are asked to wear a scarf over their head during their visit, ensuring their shoulders are covered.